Cycling in Greece and Italy enabled us to see some of the most historic and scenically beautiful places of Europe, from ancient to modern. This online journal documents a cycle trip from Athens, across the Peloponnese, and up the Italian boot. We climbed steep mountains, sped down the other side, sweated out the humidity of south Italy, struggled our way up to Gubbio, and enjoyed deserted resorts on the Italian coast. The food was the best, the scenery spectacular, and the drivers courteous. 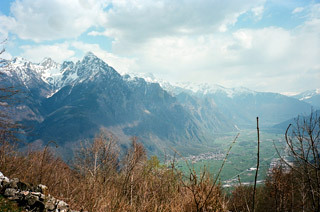 9 days cycling in the Easter week 2009 - one day trips from Bergamo (sometimes with train). Some figures: climbed 3854m/day; distance 169,5 km/day; temperature range 7-33°C; max steepness 26%; 50 new (to me) mountain passes; max altitude 1800m; hardest climb Alpe Vaccaro. It's amazing how time flies. It seems like just the other day that our fathers were taking the training wheels off our first bikes and now we've been informed that our subscription to AARP needs renewing. On top of that we get more advertisements for Medicare drug plans than we get catalogs from the Colorado Cyclist. Maybe it's time to do a Bucket List. And if it is time, the first thing on it is to cycle the Pyrenees before we're eligible for Medicare. We decided to give ourselves an easy start by cycling down the West Coast of France from Bordeaux to St. Jean-de-Luz, a scenic ride through pine and fern forests, alongside sand dunes and the Atlantic Ocean. At St. Jean-de-Luz we would take a left turn and head into the Pyrenees toward the Col de Tourmalet. After conquering or being conquered by the Pyrenees, we'd go on to Carcassone where we would make one more left turn to follow the Midi-Canal for a leisurely, and flat, ride back to Bordeaux. A three-week, 800 km cyclotouring trip across beautiful Italy (mostly camping) from Livorno to Rome, with a detour to the Cinque Terre, passing through Pisa, Firenze, Siena, Montepulciano, Lago di Chiusi, Lago di Bolsena and Lago Bracciano. Practical informations about traveling and camping in Italy and going there by train from Switzerland. 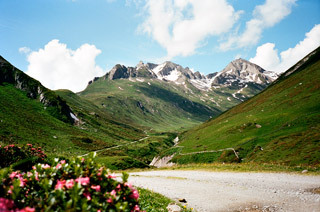 bike route between Gósol and col du Tourmalet. Circular Route 630 Kms between Gósol and Gósol by the most famous cols of Tour de France Pyrenees. Il diario del mio primo viaggio cicloturistico (da Mantova a Parigi in 12 giorni in campeggio) dalla preparazione fino alla realizzazione. Oltre al diario è disponibile una mappa interattiva contenente tutte le informazioni riguardanti distanze, sistemazioni ecc. Il diario risale al 2003 ma credo che possa comunque essere utile sosprttutto a chi si avvicina per la prima volta al cicloturismo e come me deve superare tutti i piccoli scogli derivanti dalla mancanza di esperienza. Bicycletour in the Alps with legendary climbs: Mt Ventoux, Bonette, Agnello, Passo Mortirolo, Passo Stelvio, etc. In 2008 I cycled 1807 kms and 32199 m height difference in the Alps. I climbed the 3 ascents of Mt Ventoux in a day, had a nice tour in Provence and at the Riviera. I had huge memories: riding my bicycle from the sealevel to the 2802m high Cime de la Bonette that I reached in the evening. I had a dangerous descent in the rain from Col d'Izoard. Also climbed Colle Agnello (top in fog), and another fantastic day with an italian guy, Mauro Repetti as we did the Trittico Mortirolo : 3 ascent in 1 day. The last serious ``task'' was Passo Stelvio (2760m) from Tirano. This is a photo diary of a bike trip in September, 2008 from Paris, France to Blois and Chenonceau in the Loire Region of France. It also includes a description of cycling out of Charles de Gaulle Airport. The goal this Summer was to make sure I have climbed every asphalted (at least one side) pass throughout the whole of the Alps above 1700m (which I have detailed in a list at the cycloclimbing.com site). I also wanted to include some difficult roads that are not passes. Growing list of rides around Languedoc, France. This is a blog mainly about short rides in the south of France, mostly Languedoc. Each entry has a short description of the ride, pictures, and a Google Map at the bottom, outlining the route. I do have a few longer trips in there as well, with more coming as I get out on the road and do them! Stelvio summit with Valle di Trafoi background. Weather in the picture was typically cool with constant chance of rain and snow. It was a cold summer. Von Meran in die Radmetrole Bozen, dann 'rüber zum Gardasee. Bei Traumwetter ließen wir uns über den See schippern. Die Abschlußetappe führte uns noch nach Brescia.